Port Grimaud was designed in the early 1960s by the distinguished French architect Francois Spoerry, who created an elaborate system of canals and islands, much like Venice, but on a smaller scale. Explore the winding alleyways, which are enlivened by local craftsmen, and stop at the remarkable fountain in the center of the village. Port Grimaud is a planned community built in the 70s. 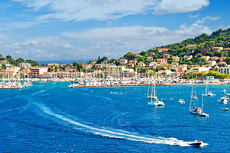 I liked St. Tropez and was able to practise my school French! Port Grimaldi was nice and I found a nice shaded park.....with seats. This area was really a waste of time, just an expensive modern timeshare. The tour was generally pretty good although the tour guide struggled with English. The tour was generally pretty good although the tour guide struggled with English. The port was largely closed due to the holiday so there was little to do with free time. There is no reason to go to Grimauld in December at all. There is no reason to go to Grimauld in December at all. It is closed down and was a complete waste of time. Port Grimaud was an empty planned town. Excellent tour. Grimaud and Port Grimaud were excellent. We visited Port Grimaud where there was a market taking place it was a beautiful place to visit.